This Saturdays G/45 Quads hosted 24 players in six sections. 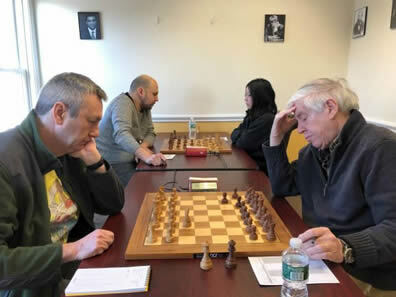 NM Oliver Chernin claimed the victory in quad one, winning two of his games. In Quad two Jack Klein took first winning all of his games. Max Ingargiola placed first in quad three, winning all of his games. In quad four, Gregory Benson came out on top also winning all of his games. There was a tie in quad five; Navaneeth Krishna and Maxwell Meister both tied for first. In quad six there was another tie with both Ross Hakala and Matt Frank placing first.